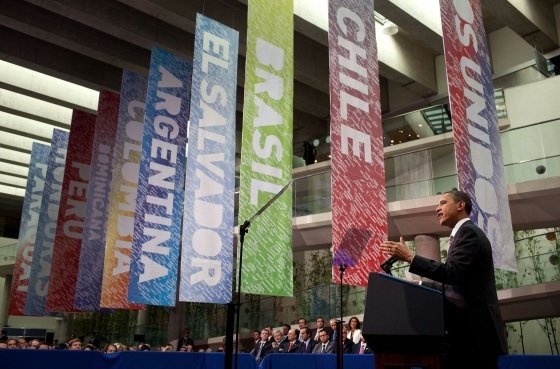 The Obama administration’s program for strengthening inter-American ties through cooperative education – “100,000 Strong in the Americas” – is now several years old and making incremental progress toward its stated goal of a multilateral exchange of 100,000 students between the United States and Latin America. The latest Open Doors report from the Institute of International Education shows that the number of Latin American students studying in the United States during the 2013-14 academic year (AY) rose 8.2 percent from the previous AY to 72,318 – the largest number to date and the largest annual percentage increase in at least 15 years. Mexico and Brazil now rank ninth and tenth respectively as places of origin for foreign students in the United States. The most recent data on U.S. students studying in Latin America is less promising. In the 2012-13 AY, 45,473 U.S. students studied in Latin America, the highest number to date but a smaller annual percentage increase (1.8 percent) compared to the late 2000s. Countries’ investments in such exchanges vary widely. Under “100,000 Strong,” figures for U.S. spending are elusive. In early 2014 the State Department announced the creation of the Innovation Fund, partnership grants that will be awarded over the next several years to strengthen collaboration between higher education institutions – including 38 grants totaling over one million dollars last year. Mexican President Peña Nieto has introduced Proyecta 100 Mil, which in addition to sending 100,000 students to the United States by 2018, hopes to entice 50,000 U.S. students to study at its own universities. (U.S. students in Mexico dropped from 10,000 in 2005-06 to less than 4,000 in 2012-13 because of security concerns.) Both countries’ financial commitment to international education pales next to that of Brazil. President Rousseff announced last summer the renewal of its Science Without Borders program, the first phase of which cost US$1.36 billion. These programs, universally seen as laudable, have thus far let certain countries fall through the cracks. Vice President Joe Biden recognized in his recent New York Times editorial that “inadequate education” is one of the barriers holding back Guatemala, Honduras, and El Salvador, from which thousands of children have fled in recent years. The development assistance portion of President Obama’s proposed $1 billion budget for Central American assistance is in part slated for strengthening literacy and vocational education. Bringing Central America into the Innovation Fund program is a logical addition to the President’s efforts, yet Central American partners were notably absent in 2014. Only one of the five grant rounds was open to Central American countries – where it arguably could have a greater national-level impact – and of the 109 recipient institutions of Innovation Fund grants, only two were from the region – and none from the Northern Triangle (Honduras, Guatemala, and El Salvador). That disparity suggests that, in spite of the rhetoric, education exchange is considered a supplementary tool rather than a leading means of bolstering development in Latin America. While the 100,000 Strong in the Americas program deserves applause as a cooperative, multilateral program, it remains an underutilized tool of U.S. engagement in much of the hemisphere. What is the quality or democracy and justice index (indices) that makes this program “laudable”, or representative of “incremental progress”? For example, what is the social-cultural-racial, ethnic, class, gender breakdown from here and Latin America who participate in this program? Relative to their numbers and station in life in Brazil (around 90 million representing over 50% of the official census), how many Afro-Brazilians, Afro-Colombians, Afro Ecuadorians, and so on of the 150 million or so Afro-Descendants who constitute the lower rungs of poverty, violence, poor health, lack of democratic access and participation in Latin America are recruited to this program? Are U.S.s citizens aware or concerned about such demographics and democracy, justice, and development implications of U.S. foreign and educational policy in the hemisphere? Does the Institute of International Education or the Obama Administration discuss and illustrate in programs policy concerns with these demographics, or just assume reproduction of historical U.S. status-quo and Euro-Latin American status quo/interests? These critical questions are not intended to be accusatory but they warrant exposure and exploration from qualified analytical and educational institutions. Mr. Early, thank you for raising this issue. The language employed on behalf of these programs as they relate to 100,000 Strong in the Americas gives a nod to the concerns you raise — sometimes described as “ensuring equal access” — but doesn’t prioritize them. Looking at the Innovation Fund Grants distributed in 2014, several of the winning programs called specifically for work with underrepresented communities. North Carolina State University, working with the University of Costa Rica, is looking to launch a program “for first year and minority agriculture studies students, whom [sic] are extremely underrepresented in study abroad.” The Universidad Intercultural Maya de Quintana Roo is looking to send students to study in the US “based on their engagement with Mayan communities and willingness to work with for economic development of the Mayan region of Mexico.” The focus of these particular programs, however, appear to be the exception to others’ topical focus (STEM, etc.). Unfortunately there’s no data available that I’ve seen that provides a breakdown of student participants into the various categories you describe — class, gender, ethnic origins, and so forth. The Open Doors online report for 2014 only offers data for country of origin, although the paper report (still on pre-order) may offer more thorough data. In terms of the Innovation Grants, US schools involved are generally public rather than private, though again, there’s no data on which students from those schools are participating. Improving connections and fostering North-South interaction through educational exchange is a laudable addition to the more well-worn and troublesome channels of cooperation that have tended to dominate regional relations as of late (counter-narcotics, etc.). That being said, the issues you raise should be among those analytical perspectives from which the success (or failure/shortcomings) of these programs is measured, both in terms of their short-term inclusion of underrepresented communities, and in their long-term impact.